Superfood was great for breakfast and diet. Definately will repurchase it again. 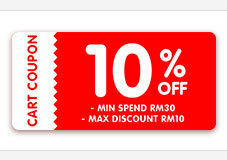 Value for money during promotion period. Have provide delivery to east Malaysia? Hi, yes we provide shipping to East Malaysia with delivery charges based on weight. Thank you. Hi, the expiry date for Twin Pack Superfood 1KG is 11/2020 & Superfood Lady is 10/2020. Thanks. Kinohimitsu Detox Tea 14s [Ginger/Peppermint Flavor] SLIMMER HEALTHY YOU!